There is a reason Gareth Edwards’ Godzilla is being hailed as the greatest monster movie in a long time – and possibly the greatest Godzilla yet. With its rich story, threads of realism, and balancing of both human and monster elements this film truly redefines and breathes new life into the genre of monster movie. If you don’t like to think during movies or follow a dynamic story, then this movie wasn’t for you. One the other hand, if you love quality, then you know exactly why this film is a fitting tribute to revive the Toho classic. This article will dive into various scenes that had something so special – so unbelievably well executed – that it gave this film a depth we don’t see from many films, especially monster films. The first time we get to see Godzilla and one of the MUTOs fight isn’t on the big screen, but rather on a TV on the big screen. As Elle is telling her son to turn off the TV, we see him watching the news broadcast of the Honolulu Airport fight. This scene immediately made the theater burst into laughter. Between the moms obliviousness and how the Muto was jumping around his larger opponent, this actually reminded me of Stan Lee’s cameo in The Amazing Spiderman when he was so busy cleaning, he didn’t notice Spiderman and the giant Lizard fighting behind him. I doubt everyone was laughing because of the Spiderman parallel. In reality people laughed because it just seemed so funny. The movie has been so serious and realistic till now, so seeing a news broadcast with a giant monster battle made us think to ourselves “HA, is this really happening?” It seemed so similar to the 50s-80s Godzilla fight scenes that would seem outlandish now a days. Seeing the fight like this at first gets all of our ‘this is so unreal’ thoughts out of our head. Thanks to this cathartic release, all feelings of disbelief are gone by time the actual fight happens towards the end of the film. What was once an unbelievable sight is now a high stakes, heart-racing battle. The thing that separated this Godzilla from all past films – besides story quality – was how the monster wasn’t the result of radioactive mutation, but rather a pre-pre-prehistoric beast. During the early years of the planet, the earth was much more radioactive than it is today. That is when these creatures roamed the earth and Godzilla was the apex predator of that time. These monsters would feed off of the radioactive material present at the time, but when the earth cooled they migrated to the deep seas and underground so that they could be closer to the radioactivity of the Earth’s core. When MUTO burrowed into the reactor, he was absorbing the radioactive fallout. This is why Joe and Ford didn’t need protection from the radioactive fallout zone. MUTO had already soaked it up like a sponge. Aside from giving these beasts a different origin, Edwards also used this back-story to give the beasts ‘powers’. While the MUTOs were able to emit powerful electromagnetic pulses, Godzilla could deliver his fiery radioactive breath – an ability that was noticeably lacking from the 1998 film. Though the most amazing thing about this explanation is that these powers actually make sense given their origin. 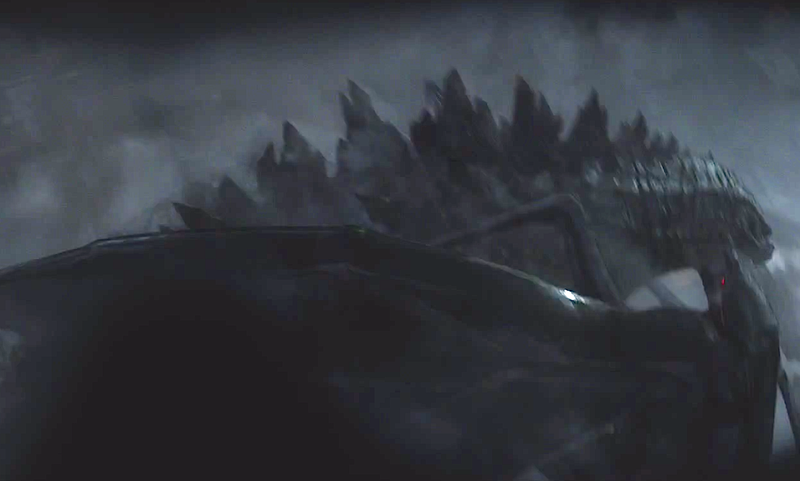 Godzilla’s atomic breath is self-explanatory. If he feeds off of radioactive material, he probably is able to store it in his body like a camel. This reserve energy can be expelled as a weapon, but would leave him weakened since he is literally breathing out what’s keeping him alive – which is why he used it only in close quarters when it’d make the most difference. As for the MUTOs, their EMP abilities make sense too since atomic blasts usually emit a powerful EMP first. The reason most people don’t know this is because everything is usually blown to shred by the following explosion. What purpose EMP blasts could have served in the primordial era is debatable. I’d need to see more of these creatures before I could determine anything. With it’s release date almost exactly 16 years after the last attempted Godzilla reboot, comparisons between these films were obviously expected. Whereas this film completely blows the ’98 film out of the water, there was actually a few shout outs to the ’98 film – the most striking of which involved suspension bridges.Whereas the Brooklyn Bridge scene in the ’98 film lead to Godzilla’s death – and the end of all action – , the Golden Gate scene ushered in the Godzilla’s rise and sustained screen time. This scene was basically the on/off switch for action; followed immediately by the start of the climactic Battle of San Francisco. The other great part of these dual scenes is how they bring out the overwhelming size difference between this new Godzilla and the ’98 ‘Zilla’. Even though the Golden Gate is much larger than it’s Brooklyn counterpart, the Godzilla for this film towers above it – rather than run across it. If Godzilla were to face Zilla, it’d be a crushing victory – literally. The look between man and beast is usually inspiring or destructive . . . this just looks drunk. The other parallel to the ’98 film was when the lead character (Aaron Taylor Johnson) and Godzilla lock eyes. This is a quintessential scene in Godzilla and even monster movies in general. It’s a chance to look into the soul of the monster and find it’s true nature. In past Godzilla movies it usually results in a feeling of understanding or Godzilla crushing the individual. In the ’98 film it happened twice: once during Godzilla’s death and the other while it’s trying to eat. Neither reveal any deeper emotions; they just seem to be there. Here we find Godzilla and Lt Ford Brody share this look after Godzilla saves Ford from one of the MUTOs, but it’s much more than just a look of acknowledgment. In fact, in the context of the scene, it’s almost a look of mutual respectful – which brings us to the next point. You’re probably wondering why such a simple ‘look’ means so much. Well taking ‘the look’ by itself, it’s just another passing coincidence like the ’98 film; but when you remember what happens immediately before this scene you’ll know why it’s so critical. Leading up to this scene, Godzilla was about to die. With both MUTOs furious with rage to protect their nest, Godzilla was pinned and was taking serious damage. The only thing that broke the MUTOs relentless tag team on Godzilla was when Ford destroyed their nest, which immediately sent the mother running. Together the MUTOs were too much for Godzilla, but dived he had the advantage. When the mother finds Ford, she sees him as the one who killed her babies. Just as she’s about to kill him, Godzilla steps in and saves Brody. That is when the look happens. Just as the mother identified Ford as the nest killer, so too does Godzilla – and also knows the nest fire is what drew the mother away from delivering a final blow. These two just saved each other; and that look is a veiled look of thanks. In fact, from this moment on you can see Godzilla and Ford as mirrors. The entire film you think Ford and his father will be parallels and Elle will die because of what Ford asked her to do – much like how his father was driven mad by the guilt that he sent his wife down to the lower levels the day she died. Ford’s life from here on out won’t mirror his father’s, but rather Godzilla’s. Despite both being beaten down and inches from death, each pushes forward and completes their mission. Just when you think both are dead for good (Ford on the boat and Godzilla after his last radioactive breath) each survives and makes it home (Ford with his family and Godzilla to the sea). Nicely played Gareth Edwards, nicely played. In the end, this is the heart of the film. Yes, Godzilla is an unstoppable force of nature, but he is also the protector. He’s the equalizing force Ichiro has been claiming him to be the whole time. No scene hints at this more than when we see Godzilla swimming calmly surrounded by an armada of battle ships. He’s doesn’t see them as his quarrel nor do the ships dare to attack him. They’re almost a part of a symbiotic relationship like a shark and pilot fish. The shark offer the pilot fish protection and food, while the pilot fish keep the shark clean and help. This human and monster team up seems so insane; yet so natural. It is through these techniques that Edwards was able to combine two very different types of Godzilla – nature’s destroyer and man’s savior. This idea gets is fulfilled in the end when Godzilla awakens and walks back into the sea without anyone dating to attack him. He is the city’s – and maybe even the world’s – defender. Balance has been restored; and he and man can return to their peaceful lives. Words cannot begin to describe how much credit Gareth Edward’s and the rest of his amazing team truly outdid themselves with this film. There is a reason Godzilla is the King of Monsters, and this film demonstrates all of that. The days of giant monster battles that don’t make sense are over. A new age has begun; and it looks like this. So many reboots have ended horribly over the years. It’s so refreshing to see one that manages to translate a classic into the present day while still honoring the original flawlessly – and with Edwards and his team already discussing future movies, there’s so much to be excited for! I agree Chloe, that would have been great. The intro gave it that very vintage feel – which was amazing – so an ending would have also been great. Although maybe that was the point, vintage film into the new century (old beginning, new end). *shrug* Either way, can’t wait for the sequel(s).